Mission #320, 22 February 1945 to Ulzen, Germany, 1Lt. 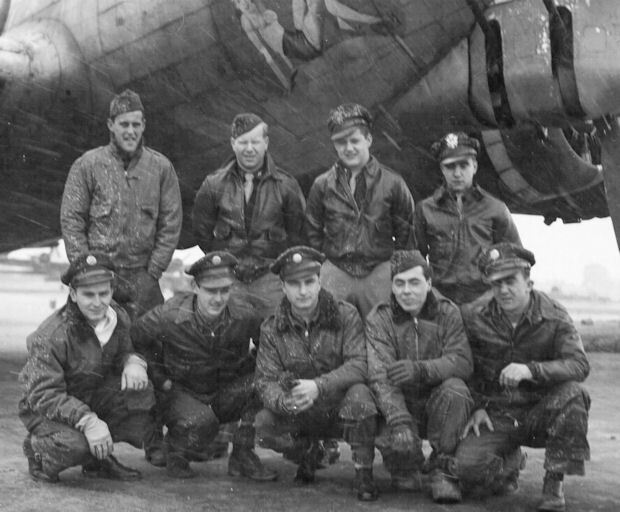 Jack W. Weaver's crew flew the 360th Squadron deputy lead in 360BS B-17 #44-8647 (No Name). Sgt. Thomas D. Lardie flew as ball turret gunner and took 16 mm motion picture film of the mission. The film showed group formations, lead PFF 360BS B-17G #44-8552 (PU-X) dropping its bombs, target strikes and explosions. Sgt. Lardie received a 1st AD Commendation Letter for his excellent filming. Some of the action was later used in the movie "12 O'Clock High." Sgt Alfred D. Wilson, ball turret gunner on the 427BS F/O Julius Demian Crew, filmed from B-17G #43-38248 Jigger Rooche II. He also received a 1st AD Commendation Letter.